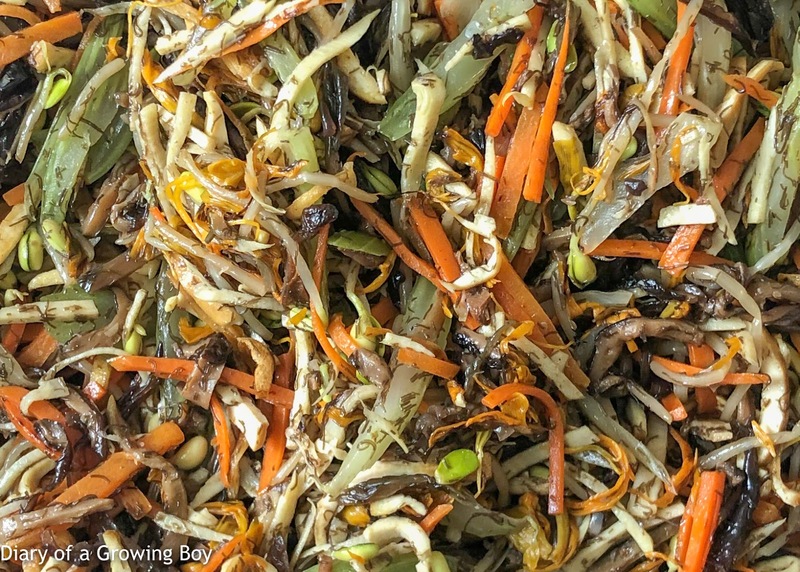 Once each ingredient is cooked, its then added to the pile and mixed while air-cooled with the use of fans, blow-dryers (hence Blowing Boy...), or even sticking the pan out the window to interact with the cold air outdoors. One of the highlights of the dish is the different textures provided by the ingredients, so the last thing we need is stuff being overcooked and becoming limp - depriving the diner of crunchy bites. Once all 10 ingredients are down, the pile of thoroughly mixed in order to achieve, as much as possible, consistent texture in each and every bite. It's also typically served cold to preserve the crunch. In recent years, mom has been increasingly cutting the carrots and celery into bigger chunks in order to up the crunchiness. We would eat this over a few days, hoping to finish the batch before the daylily flowers starts going bad - which starts to become a possibility once we pass the 1-week mark. Some people may think this dish is no big deal, since it's just a bunch of vegetables and not really worthy of much attention. It's a shame that dishes like this are losing favor, because it requires way too much effort to make... and since many diners will see it as a vegetable dish - and therefore think that the ingredients are cheap - it won't show up on restaurant menus as people won't pay much for it. Like many of mom's dishes, it's simply not economical to make them properly in a restaurant setting. The other dish that mom likes to make - which doesn't necessarily need to be for lunar new year - is her braised stuffed sea cucumber (海參鑲肉). This was also part of the cooking lesson in 2012. The process actually takes days from start to finish, as sea cucumber comes dried and needs to be rehydrated over a few days. It needs to be cooked and cleaned of the sand inside, and the process repeated a few times. The big issue with this - and the reason why mom insists that there is no recipe for this part - is that each sea cucumber is different. 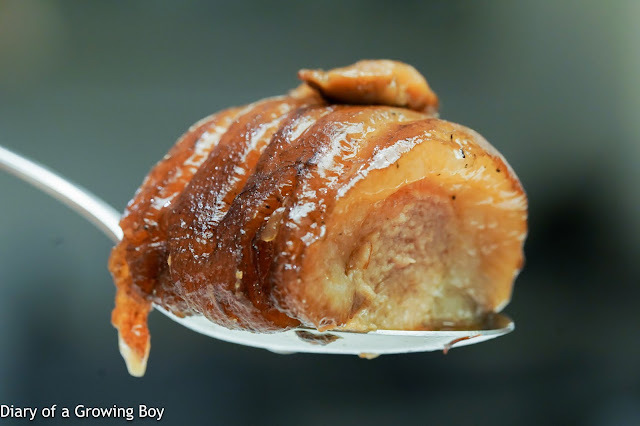 Some will require more cooking time than others to achieve optimal texture, and when you're braising more than one at a time, that becomes challenging. 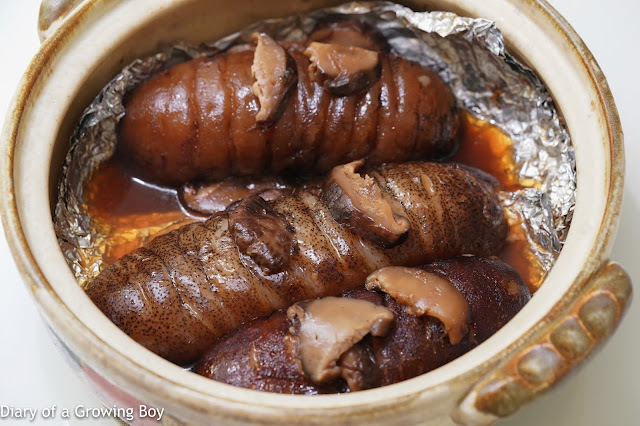 Once ready, the sea cucumbers are then stuffed with a mixture of finely minced pork and diced ginger. I absolutely love this dish. The soft, wobbly texture is fantastic... and the collagen has melted to a point that it starts to coat the lips, but hopefully not overcooked to the point that the sea cucumber starts to melt and collapse. Both of these dishes are labors of love, and shows just how much mom loves us each time she cooks them. Neither dad nor I will ever get tired of eating these.